Is this setup for sale ?? Is this sold as a set or individually ? Do you have the buckle and revolver for sale? If so, at what price and procedure? 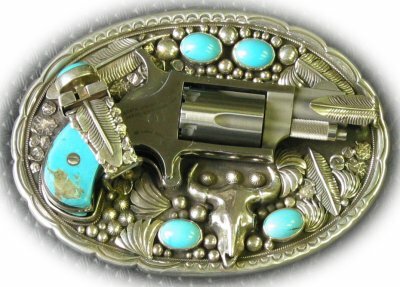 I’ve seen quite a few of these in the past 40 years but this belt buckle is certainly one of the cleanest designs and most thoughtfully accented pieces I’ve seen yet. BRAVO, to the Artist, the craftsmanship is just stunning!!! I have not seen one of these for over 30 years. Have been looking for one ever since. Hi Lucas, I have your same Issue. I’d like to use all of the access potential by linking sharepoint lists but it is so slow that is unusable. I have a list with over 16000 elements and 16 columns… Did you solve your problem?